In a country where headways in business and technology happen just about every single day, it becomes a pre-requisite to keep oneself abreast with contemporary advancements in management domains. The business world today is in constant pursuit of achieving the unthinkable, while persistently testing boundaries of its own potential. Amidst such immense activity world over, it’s of utmost significance that an aspiring professional is adept at the management roles and decision-making abilities. An MBA or Masters in Business Administration thus becomes the most sought-after recourse for leaders wishing to cause ripples in the status quo and scaling their professional careers to new heights. MBA curricula precisely cater to bridging the gap between the theoretical and the practical aspects of classroom teachings and takes the learning on the field to face the real-world scenarios. The kernel of the program lies in the pedagogy which is dynamic, innovative and adds substantial value at each stage. It acquaints the student with the understanding and skills of various dimensions of a business, viz. marketing, economics, finance, operations, human resource and others. Inculcating case methodology/discussions, group exercises, interactive class participation, frequent guest lectures by industry stalwarts, live projects, and internships in the MBA program imbibes the student with ample skill sets while giving them opportunities to build industry networks. The teachings of an MBA program extends the classroom and helps shape an individual’s personality, makes one a productive team member, improves communication skills assists in honing one’s leadership qualities, makes one a problem-solver and fine tunes the analytical thought process. The programs are designed to prepare students for careers in industry, across functional areas. The program equips students with strong conceptual skills to manage businesses in an integrated manner. These activities act as a strong foundation and help the student build an excellent career on these grounds. The emphasis is on developing a holistic manager with a vision to take on the challenges of the future in a socially sensitive manner. Largely, an MBA aims at shaping individuals who are well versed technically, and know how to manage and lead teams which produce unparalleled results. The understanding of various business processes, strategy building, operations and other technicalities of a business are imparted to the student in an exhaustive manner at an early stage of the career. Students pursuing MBA thus, have the advantage of becoming shrewd decision makers, efficient problem solvers, and leaders who envision upcoming changes and also lead them because of the comprehensive structure of the program. MBA as a program has stood the test of its time. Though considered as one of the most reputed courses across academics, there have been doubts and questions by critiques about the relevance of an MBA program in today’s business environment. These reservations are majorly because of the kind of investments people make to pursue an MBA course. Despite such reservations, the value addition and development that comes with an MBA degree far exceeds the doubts. It is a well-known fact that MBA graduates enjoy a certain privilege when it comes to job hiring due to their professional approach towards studies and the amount of exposure they receive in their two-year programme. The program over the years has evolved itself according to the changing market requirements and needs. It has become more dynamic and practical in terms of industry-oriented course modules and the kind of activities that take place on the campuses across universities. The contemporary MBA courses have intelligently structured themselves to cater to the on-going needs of the industry, be it corporate specific, business specific or even start-up specific. This is one of the fundamental reasons that gives this program immense credibility and following. Today, MBA is not what it used to be a few years ago, modern MBA has remodeled itself entirely on grounds of the business activities occurring throughout world economies. Each member of the IMI fraternity is a firm believer in sharing knowledge. 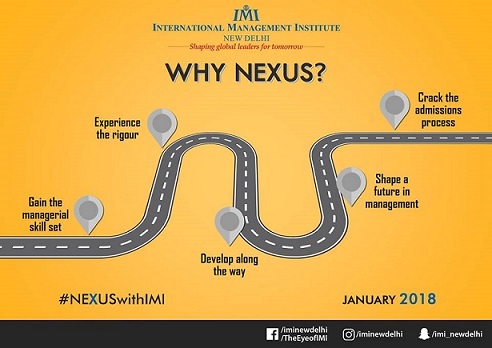 Having realised the need for the direction of the MBA aspirants, IMI, New Delhi is organising ‘Nexus 2018’. The idea of this event, as the name suggests, is to convene and converse about the life of an MBA. The challenges an aspirant faces to secure admissions, what goes on in the 2-year journey, how to tackle the challenges faced head on, and the prospects of a graduate will be points of discussion in the conversation the institute has planned for CAT takers. IMI remains to be a facilitator of learning at heart and is proud to have organised this talk in 8 cities in January 2018. Representatives are travelling to Mumbai, Delhi, Chandigarh, Kolkata, Bangalore, Ahmedabad, Trivandrum, and Hyderabad soon, to have this heart-to-heart with the managers to be, nationwide.